Melenevsky, Marian [Маріян Меленевський] – active figure in political and co-operative society affairs; born on 15 July 1878 in the village of Fediukivka (Lysianka raion, Cherkasy oblast, Ukraine; at that time – Tarashcha county, Kyiv gubernia, Russian Empire); died on 20 January 1938 in Moscow (Russian Federation; at that time – Russian SFSR); buried probably at the Butovo mass burial site, Moscow. In 1913-1914 Melenevsky lived in London where, in March 1913, he was a co-founder of the Ukraine Committee. He also became involved in establishing an interface between co-operative societies in Ukraine and the British market. At the outbreak of the First World War he returned to Lviv where he joined the recently-formed Union for the Liberation of Ukraine (ULU). Shortly afterwards he moved to Vienna (where the organisation was based after the occupation of Lviv by Russian forces) and became a member of the ULU presidium. 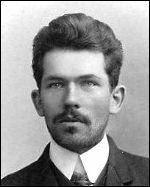 After the 1917 February Revolution in the Russian Empire he returned to Ukraine and lived for a while in Kyiv. There he ran a private trading business, and also became involved in the work of the Central Ukrainian Co-operative Committee, an association of Ukrainian co-operatives. In January 1919 he was appointed, with the rank of counsellor, to the diplomatic mission to London of the government of the Ukrainian People’s Republic, and in April of that year arrived with the mission in the United Kingdom. After the winding up of the mission in 1921 he remained in the UK and worked for a number of Soviet Ukrainian institutions, including the London office of the Ukrainian government’s central famine relief committee (from 1921, during the 1921-23 famine in Ukraine); the London office of Ukrzovnishtorh, the Ukrainian foreign trade department (from 1923); and Ukrainian Co-operatives Limited, a joint overseas representative body for Ukrainian co-operative institutions (secretary from 1 June 1924). In 1930, with the closure of Ukrainian Co-operatives Limited (following the abandonment of the New Economic Policy in the Soviet Union), Melenevsky returned to Ukraine and was appointed rapporteur on agricultural export matters of the Ukrainian foreign trade board in Kharkiv. In the autumn of 1930 he was arrested and charged with belonging to a counter-revolutionary organisation, but the charge was not proven and he was released in May 1932. In 1937 he was living in Moscow and working as a consultant to the procurement department of the central administration of the USSR silk industry. On 27 October of that year he was arrested again, charged with membership of a counter-revolutionary terrorist organisation, and was executed on 20 January 1938. On 1 August 1957, during the period of de-Stalinisation, he was politically rehabilitated.